One of things an Imperial always did better than every other speaker was low bass. 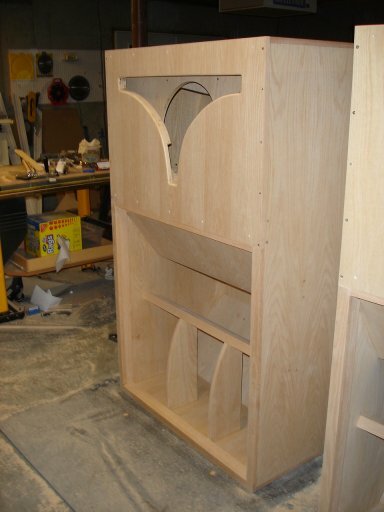 Unlike our implementation of the original Imperial, Steve Deckert designed this one specifically as a sub-woofer. It uses a radical new concept in horn theory to accomplish an end result that's nothing short of spectacular! How does it work? The Imperial horn flare was designed to bend waves up to 600 cycles making it very efficient up to that frequency. When used as a sub-woofer, even with a 24dB per octave active crossover, you can still hear vocals down in the horn flare. Not a problem in a large commercial venue, but in a private listening room the close proximity to the listener makes it possible for this low level information to be heard thus polluting part of the sound of your main speakers. To eliminate this and other problems, the design of the horn has been completely changed so that the horn flare resonates at low frequencies with no high frequencies ever getting down inside the throat. Rather than rear-loading the woofer as in the original Imperial, the Imperial S.O. has the woofer running in a sealed cavity and the front of the driver is rather esoterically loaded to bias it's output towards the throat. The throat is exposed to the room taking the shape of a narrow slot and achieves a resonance just like a beer bottle would with wind blowing past it's top only at a much lower frequency. It is possible with the right driver to run these cabinets full range with no crossover giving a nice blend into a high efficiency full range speaker. Even when running the driver full range, you can crawl into the mouth of the horn and still hear no mid bass, mid-range or treble. This results in really clean bass and ensures nice black backgrounds with any type of music. Another advantage of this design is that it will function better in a small room. Having the driver in a sealed box and pre-loaded against a variable rate slot also protects the it from getting loaded up from the room. 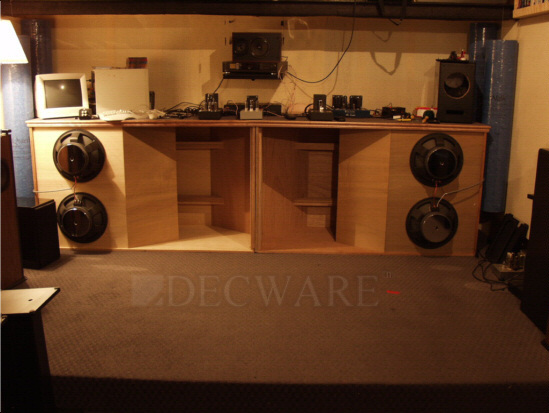 This concept in part came from Decware's car audio enclosures such as the Deathbox, where results became predictable from car to car. Another benefit of the design is that it also significantly reduces sympathetic resonance's. Shown below is the Decware implementation of the original Imperials configured as subs. 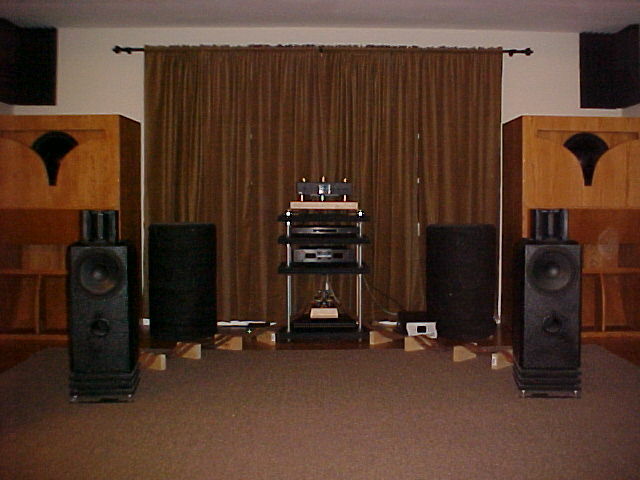 As you can see, with woofers exposed to the room and the flare of the horn, they are bound to resonate with any low frequency sounds in the room. When I listened to speakers placed in front of it, I seldom hooked an amplifier up to it because it made plenty of bass all by itself. With the new Imperial S.O. design, this problem has been practically eliminated, allowing you to hear what a given pair of speakers placed in this room might actually sound like on there own. Compared to the picture above, the S.O. design is a far cleaner sounding bass with a noticeably lower hit. You can find tons of tech-talk about this design in our support forum. The plan above is available as a large hi-res gray-scale image that can be viewed online or downloaded and printed.